Made with crunchy peanut butter and semi-sweet chocolate, serve these peanut butter-oatmeal chocolate chunk cookies with a glass of milk! During the holiday season, I find that I often think of holiday flavours for treats, think peppermint cookies or gingerbread muffins, but the truth is, a chocolate chip cookie is just as much a holiday cookie as anything else. When I’m baking for the holidays, I’m making cookies and squares and bars because I want to share them with people, because holiday baking is about baking not about the flavours of the treats. Do you agree? While there are some traditions, like the cutout sugar cookies with royal icing that I make without fail every single year, I’m always changing up the other cookies I bake. This year, peanut butter-oatmeal chocolate chunk cookies are on the list, and this is one of the best chocolate chip cookie recipes I have made in a long time! For as long as I can remember, I have always preferred chocolate chunk cookies to chocolate chip cookies. I always love seeing the big chunks of chocolate in my cookies because it reminds me of the delicious ginormous cookies you can find at bakeries around the city. Plus, I always find that there with chocolate chunk cookies, there will most likely be more chocolate, which is a win in my eyes because I don’t believe there is such a thing as too much chocolate. These cookies use an entire 225g package of Baker’s semi-sweet chocolate (about 8 oz), which you chop up into whatever size chunks you desire. I like to cut some into smaller pieces so you have chocolate specks sprinkled throughout the dough as well as some larger chunks that poke out of the peanut butter-oatmeal cookies. If you’re crazy for peanut butter and chocolate (who isn’t?) you should check out this collection of peanut butter and chocolate recipes to get started. It was so tough to pick a recipe for this month’s What’s Cooking theme, but I went with this classic cookie and I am so glad that I did. I can’t even count the number of people who have asked me for the recipe. Last year, I shared a delicious peppermint cheesecake square recipe which is another incredible and decadent treat, I think a platter of these peanut butter-oatmeal chocolate chunk cookies and peppermint cheesecake squares would be incredible this holiday season. 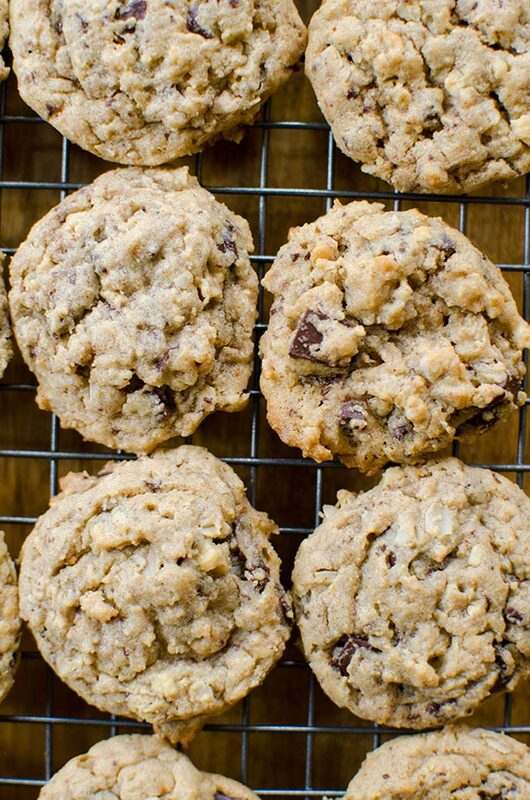 With crunchy peanut butter, oatmeal and chunks of semi-sweet chocolate, these cookies combine chocolate and peanut butter into a perfect chewy cookie. This recipe yield 42 cookies which makes the perfect amount to share with friends and family this holiday season. Mix oats, flour and baking soda. Add to peanut butter mixture; beat until blended. Stir in chocolate. Drop teaspoonfuls of dough, 1 inch apart, onto baking sheets. Bake 10 to 12 min. or just until centres are set. Cool on baking sheets 3 min. Remove to wire racks; cool completely. Let me know if you give these cookies a try in the comments below! Disclosure: This post was sponsored by KraftHeinz Canada – as always, all opinions are my own. 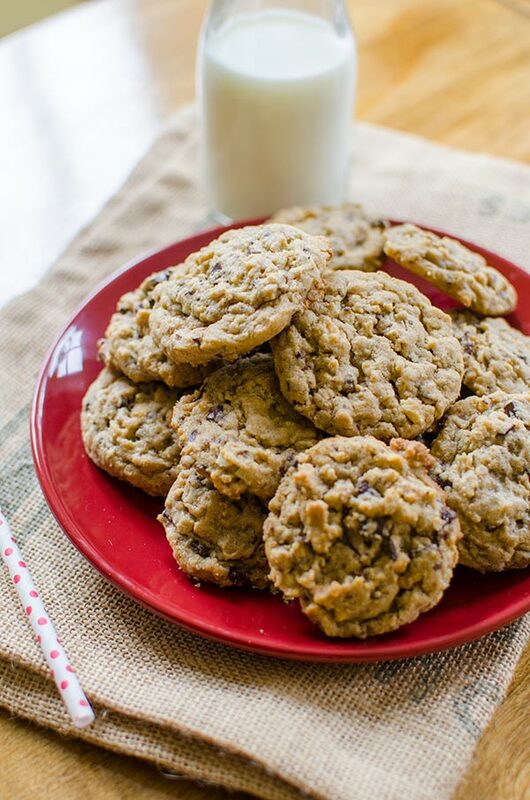 Thank you for supporting my sponsors and allowing me to continue creating recipes like this peanut butter-oatmeal chocolate chunk cookies recipe! Guess what? It's another excellent recipe that I am going to make! 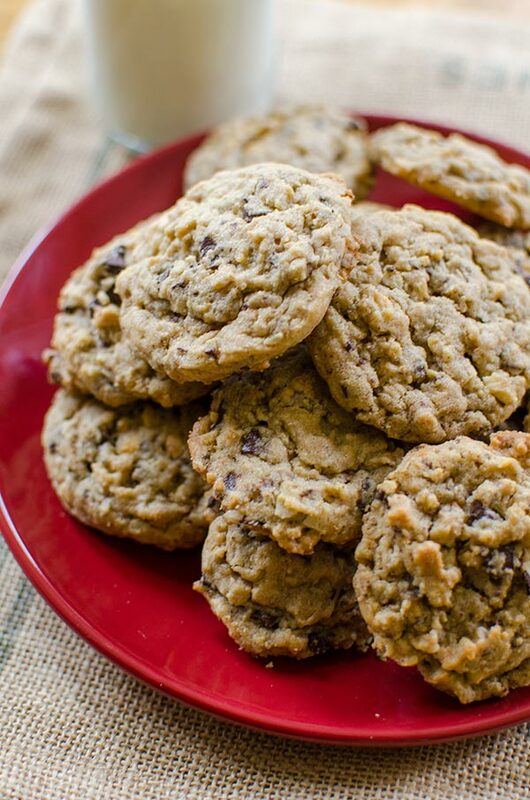 My mouth is watering for a taste of one (or 3) of these cookies, right now! Hello. Can we use ground flax seeds or a mashed banana to replace the egg please? Hi Reesha, I've never tried that myself but I imagine a flax egg would work fine. The banana might alter the flavour a bit and add too much moisture. Let me know how it goes if you give it a try! OMG...This recipe sounds & looks soooo yummy! I will definitely be making it & sharing it with friends! Thanks -- they are SO good! Let me know if you give them a try. I'm not a baker but have made this recipe twice. It was a huge hit with the family so the batch of over 40 good sized cookies didn't last long!